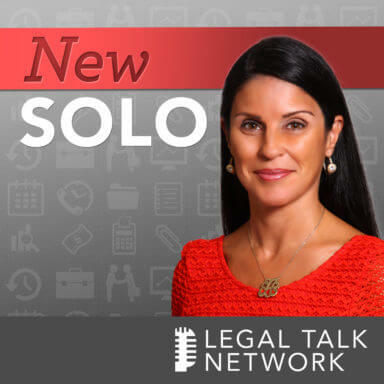 Adriana Linares: Hello and welcome to New Solo on Legal Talk Network. I am Adriana Linares. I am a legal technology trainer and consultant, normally based in Orlando, Florida. If you are a regular listener you know that I travel a lot. Of course my favorite city is New Orleans, which I will get to be in, in a couple of days, but today I am in the great city of Omaha, Nebraska. I came to Omaha a couple of days ago to speak at the Solo/Small Firm Conference that Nebraska and Iowa were having together and I came to give a presentation and help Clio at their booth. So Clio is one of our sponsors. That gives me a great opportunity to thank them, not just for sending me to Nebraska, but also for being a sponsor for New Solo, along with Solo Practice University. So make sure you check both of those out. I would like to welcome Mary Vandenack to today’s episode. Hey Mary! Mary Vandenack: Thanks Adriana for having me on the show. Adriana Linares: Mary, thanks for letting me into your home, you are so sweet and nice. We are good friends; we have been friends for a long time and when I told you I was coming to Omaha and that you were going to be a speaker at the conference, it was pretty coincidental, you said, oh, stay with me, we will have some fun. And we have had a really good couple of days. Mary Vandenack: We have had a really good time. The conference location had a lot of great Poké Stops so we were able to add a little to the legal part of the conference and have a little fun. Adriana Linares: And should we even confess that we may or may not have been out Poké hunting until 10:30 and 11 o’clock at night for the past two nights across Omaha. Mary Vandenack: Unfortunately, I have posted on Facebook and social media, so I have got a few messages like, please tell us that you have not fallen susceptible to that particular game, but I have, and it’s a lot of fun. Adriana Linares: We have had. It is fun. We have had a good time. But the reason you were at the conference; I mean I was there because I was helping Clio out and I gave a presentation on practice management, but you were there talking on two different topics. One of which I specifically came up to you and said, hey, well, we have got nothing else to do between Poké hunts, let’s record a couple of podcasts; I decided we are going to have to break this up into two, because the topic is — I wouldn’t say it’s complex, but there’s a lot to talk about, and it’s alternative fees. It’s one of your favorite things to talk about and teach other lawyers about. So that’s what you were doing at the Solo/Small Firm Conference, right? Adriana Linares: And exactly what is — I feel like lawyers hear about it and read about it all the time, but can you just quickly describe in case someone is still trying to grasp it, or maybe they are new, or maybe they are a new lawyer, which they are, this is kind of geared toward new solos, new lawyers, but I know that we have a lot of other types of listeners, but what is an alternative fee when it comes to thinking about running a law practice? Mary Vandenack: An alternative fee generally is any fee, any way of charging for a law firm services that isn’t actually the billable hours. So the traditional way of charging is, here’s my rate and I am going to charge you based on how many hours this takes me. An alternative fee, and there’s several different types that we will talk about, is just any way of doing it that is other than the hours times the rate. The billable hour is still how you figure out what your alternative fees are going to be, at least on some of the fee types, but it’s not just hour times rate and here, whatever the bill you get at the end of the month is going to be the cost. The key component of it that we are going to be able to tell the client upfront, this is what I am going to charge you for the particular service that you are looking for. Adriana Linares: And in your law practice, which tell us real quick a little bit about what you do here in Omaha and the type of practice that you have, you regularly include an alternative fee structure when you are working with your clients, right. So tell us what you do? Mary Vandenack: So my partner and I founded our firm several years ago, and we broke off of a big firm, and so we did a lot of thought on who and what we could serve when we came out of a bigger firm into a small firm environment, and originally it was just the two of us starting this particular firm. And what we wanted to be able to do was to be really clear about, we are pretty efficient, we are pretty technologically oriented. Adriana Linares: Wait, wait, were you shocked when the client said that to you or did you think, well, that makes perfect sense, because as a consumer I always want to know whatever I am going to be paying for, I want to know the cost upfront. I mean, whether it’s my lawn guy or the dentist or another consultant. Were you shocked? Because I feel like clients are often — I mean, my clients I should say, which are the lawyers, are often surprised to hear that maybe a client wants to know upfront what it’s going to cost them for their services. Mary Vandenack: I think it is. I don’t know that I was shocked so much as I made a decision at that moment that that was — it was like, wow, that is really right, because she gave me the same type of example that you just did. She said, if I go to the grocery store and I decide I want to buy Kraft Macaroni and Cheese or the store brand, it tells me how much each option is going to cost and I can make a decision based on my cost. Adriana Linares: And it breaks it down by the ounce, FYI, right? Adriana Linares: I mean, like there’s a micro cost there that I am aware of. Mary Vandenack: And her point was, look, a well-run business looks at opportunities, looks at cost, and so in going into — and it was actually a fairly big project that she was giving me. I remember at the time going, oh, I have no idea how to figure out what I am going to charge for this project, but I was talking to her about it and saying, well, look, I have got to look at this, I have got to look at this. And she said to me, break that down into those pieces, but I need to know how much it’s going to cost so I can make a good decision. Adriana Linares: And as part of the fear, which I am going to guess that your answer is going to be yes, because I have this fear as a consultant when I do project-based billing, that you are either overpricing or underpricing it, like it’s just hard to figure out the exact right cost, right? Adriana Linares: And you are locked in. Adriana Linares: But that’s not right. Mary Vandenack: That’s not what an alternative fee is. You might use a flat fee for some really what I call the commodity type of services; somebody is forming a new business entity, well, you know the parameters of the formation, you can come up with the rate and stick by it. Any additional services, and that’s one of the keys in developing flat fee models is that, okay, if I am going to do an entity formation, it’s going to be — we charged 650 plus cost for basically a fairly simple formation, and that’s actually price competitive with LegalZoom for its full service entity formation. But we are really clear about what we provide for that particular cost and we are really clear that if there’s additional or different services that the client needs, we are going to quote those differently. Adriana Linares: And you would communicate with them obviously. It’s not like a bill is going to show up with these additional costs, you will call them up and communicate and say, you know, based on what we talked about when we took on this relationship, there’s these extra charges that — or these changes in the charges. Mary Vandenack: I think that communication piece is the most important part of the process, and for whatever the reason the most challenging part for lawyers to take on. Adriana Linares: Yeah. I think for all of us, but yeah, definitely for lawyers. Mary Vandenack: But I have gotten where I have just realized how important that conversation is, so at the very first meeting with the client, I never let a client walk out of my office where we haven’t talked about what it’s going to cost. And if I can’t give them the cost at that moment in time, which is sometimes the case, I at least tell them how we are going to figure that out and when they are going to hear from me, and I am going to give them a cost before I have them sign an engagement letter. I am at least going to give them a range. I am going to give them something that knows. And I also in that, what I am really proactive about is watching what is actually being consumed in terms of time and what’s going on with the project, so that if there is a change, and there is sometimes; you have in the estate planning world, which I do a fair amount of work in, a lot of times it’s a huge process for people in terms of, they might be estranged from a child, or they might not have kids and it’s, what do you want to do with your wealth if you don’t have kids, those are all big decisions and people will change their mind in the process. So we usually say on that process with the trust document, this is the trust that we are going to draft for you, and we include in that cost, it’s going to be we are going to send you a draft and one set of revisions, and as long as that’s the process, this is the cost. If there’s a second set of revisions that was our fault, then that’s going to be included in the cost, but if it’s because the client changed their mind, at that point it’s going to be their cost. But what we do as soon as that begins to happen is we communicate with them about, the cost is going to be different. And we make that clear upfront exactly what we are going to cover, so that it shouldn’t be a big surprise. Adriana Linares: And your firm, before we go any further, I don’t want to forget to ask you, is how big and how many lawyers do you have, tell us a little bit about your practice? Because you mentioned business formation, you mentioned wealth planning, but I know that you also do very cool work with gun trust and gun laws. So I want to make sure that we say that about you because that’s so cool. Mary Vandenack: The gun trust is kind of a fun area, and being in Nebraska it’s really a pretty easy area to practice in, because just about everybody seems to own guns in Nebraska. But as a generality, Mark and I, my partner, and unfortunately my partner has taken an in-house position with one of our clients, so he won’t be here anymore and I am really sad about that, but we founded the firm with just the two of us. And at the time it was going to be the two of us and we were going to live happily ever after our laptops. Adriana Linares: How long ago? Mary Vandenack: 12 years ago. And we started our firm in the farm field, in the basement of a building out in the farm field. Mary Vandenack: And we were going to be there. And then one of our former partners decided to join us, so we ended up running a real office. And then we promptly grew to 15 lawyers at that point in time and we started looking at each other going, okay, thought we left a bigger firm to be little, light, and lean. That’s when the economy went south and by attrition and whatever we were back down to four or five. We have stayed — right now we are nine, with Mark’s departure we will be back to eight, which is more than plenty for me. But what we did was created a tax and business boutique. So we said, well, who and what can we serve if we want to stay small, we don’t really want to become a big firm? Again, so we decided we could serve the people who are forming businesses, and the second piece of it was, I had been at a law firm where they focused on invading relationships. I didn’t want to invade relationships; I wanted to build relationships. Adriana Linares: That doesn’t sound that great. Adriana Linares: Anytime the word invasion is used it can’t be good. Mary Vandenack: I used to turn on to the street going to my really fancy office and get a stomachache when I was heading there, and they were a great law firm actually, it just wasn’t my style, and that’s what I always say, it has got to be your style. So what we decided is that a great opportunity would be to help people start businesses. You are helping them, hopefully, fulfill their dreams. It doesn’t always work out that way, but we have had a lot of really amazing success stories. But I am a tax attorney by day and Mark was business and transactional, so we brought together those skills, and that’s who we decided to serve, and it has been a really fun one. But I personally either do or oversee at this point the gun trust type of thing I do; pet trust is another little area that I have. Adriana Linares: Yeah, that’s fun. Mary Vandenack: I do a lot of work in the artificial reproductive technologies. So one of my client’s daughter got a brain tumor and what they did is they harvested and froze her eggs because she hadn’t had any children yet. So things like that are — I kind of consider those within the estate planning area. I do a lot of business succession planning. I also do a lot of work for real estate developers, so I get to a lot of times have clients setting up real estate type of investments and projects. I represent some guys that I have helped them create holding companies to organize their investment structure or business structure, and that’s fun as well. Adriana Linares: Okay, of services. And is there any one of those practice areas that you can’t have an alternative fee option within? Mary Vandenack: I have the alternative fees with everything I do. So it might be in some cases, especially like say when I took a client and they had 30 baby project entities with various businesses in them and we organized them into a couple of holding companies, that’s a really hard one to say, it’s going to cost you X dollars, but what I can always do is break that project down into parts and price the project by parts, which the client is usually happier with it instead of seeing, hey, the fee for this is going to be this huge ginormous amount. By the way, I am going to create this holding company for you and move all the projects into it and here, it’s going to cost you this giant amount of money. It’s a little more palatable if I break it down and say, well, look, we are going to need to form the following new entities and the cost for each of these entities is going to be a certain dollar amount. And the research, we are going to have to do in a few states, because you are in some different states, or we might have to contact an attorney there, it’s going to cost this amount. So you break it down into the parts. They can see the parts, they can see the process, and they are a little happier to get that. But at the end of the day there is a bottom line, it might be a range rather than — but we are going to commit to a maximum amount. Adriana Linares: And in our second episode, part 2 of this, because we had to break it into two, because there’s so much good information, you actually have a 6 — I am going to call it your simple 6 step process and we will go through figuring out sort of how to break that down and what those ranges are. So you and I had a funny exchange at the Solo/Small Firm Conference; actually, I was like the fly on the wall with another attorney. We were sitting at a reception and the two of you happened to do the same type of work, but I don’t even know when you started the discussion about alternative fees if he knew that you guys did the same type of work. So I think the discussion started and he said, well, I can’t do flat fee or alternative fees because my work is very customized, and I watched you almost stroke out, because I knew that you were going to say, hardly dude. So tell us a little bit about that typical exchange you have with lawyers with them saying, well, my work is very customized, there’s no way I could ever do this, what do you say to them, what did you say to him? Mary Vandenack: I don’t remember exactly what I said to him. I think I was busy trying to recover from stroking out. But that’s one of the most common things that I do hear from clients in any practice area. For me, in my practice area it was particularly compelling. I would admit that the first time I had a litigator say that to me, well, I don’t litigate, but what I did with that litigator was challenged him. Well, let’s sit down and talk about that, because I don’t do what you do. But this particular case is — and I used that in my presentation the next day as an example, which is, okay, so the really common thing and I think that attorneys keep themselves from benefiting from the advantages of alternative fees, which there’s huge advantages in that. Adriana Linares: And I think that’s one of the misconceptions that you talked about is that, and that was one of the questions I had for you too is, what are the misconceptions and/or the perceptions that either clients or attorneys have, and I think that’s probably the biggest one, right? Mary Vandenack: That is the biggest misconception. I can’t quote this, because it’s too complicated. So my challenge to anybody who makes that statement is, you know what, let’s talk about that, let’s really look at what you do. So I do a lot of complex estate planning and at the end of the day there’s certain pieces of that process that are the same, and we are going to talk about that in more detail in the next podcast, but to me it’s a generality, even within the complex areas that I do, there might still be 10 different paths that I am going to take people down, and I can look at each of those and say, okay, but it’s a matter of breaking that complex project down. And my challenge to any attorney who says to me, well, look, I can’t possibly quote that is, well, have you ever done it before, because you have done it before, then you should be clear that there’s a process and you should break that process into pieces and then price the pieces of the process. And the same gentleman, because I did address that specifically in the presentation, came up to me and talked to me afterwards and asked me to come over and help him out a little bit with that. And I will follow up with him, because I think, one, that clients are happier if they know what they are going to pay. And secondly, I think that personally people will ask me, well, what are the market forces driving the use of alternative fees, Mary? I am like, well, you know what, right now if you are in high end work, you can probably get your rate times your hour. My response to that is, who cares, I want my rate plus times my hour if I can earn that. And if I can be really, why should I not get the benefit of being super efficient and super organized and using technology. Adriana Linares: And I am sure you do. Mary Vandenack: And I do. And what we do as we get more and more automated is we usually give the client a break, but we keep some of that. That’s why we don’t use the hours. If we know what others are charging and we keep close tabs on that and pay attention to what people are being charged for similar types of services, then we try and make sure we are competitive with those, or giving clients a little bit better deal, and if we are making good money or we are making a little bit — essentially a premium rate with the alternative fees, we are good with that. Adriana Linares: Well, that all sounds good. Listen, before we move on to our next segment we are going to take a quick break to hear a message from our sponsors. Adriana Linares: Okay, welcome back to New Solo. I am Adriana Linares. I am in Omaha, Nebraska with a dear friend and a very smart lawyer and businesswoman, Mary Vandenack. Before the break we were just sort of talking about what is an alternative fee, the misperceptions and perceptions for clients as far as figuring out how that works. And Mary, what I wanted to talk about now in the second half are, is there only one type of alternative fee, are there different types? When somebody says, I don’t even know where to start, do you have to start with figuring out which type of alternative fee there is, or what are a couple of your favorites? Mary Vandenack: That’s a really useful process, because I think that there’s a misperception there in that the flat fee, again, means, I can assign exact dollar amount to every project, and we have already talked about the fact that that doesn’t always work. One of the simple easy ones that we do use for what I call our commodity service is a flat fee. And we have designed that in a variety of ways. Adriana Linares: So wait, so I keep using flat fee and alternative interchangeably. Mary Vandenack: They are not. Adriana Linares: They are not, okay. Why didn’t you correct me, correct me now. Mary Vandenack: So an alternative fee generally refers to any way that we are compensating other than the hourly rate. A flat fee is, hey, I am going to do a simple will and I am going to charge you $350 for that simple will. I am going to do a healthcare power of attorney and I am going to charge $100 for that. One of the other ways that we use flat fees that I think is pretty creative and it works extremely well. We get regular calls for somebody to review a contract and what we will do is, that’s one of the ones — it actually is somewhat hard. So we have come up with a set rate for types of contracts. I, for example, review a lot of physician employment contracts. And what we do is say, this is what we will do, we will review the contract and we will provide you comments, and those comments are going to include, here are key things just to know about signing a contract like this, but you are not going to be able to negotiate them. Here are your deal breaker items and here’s what we suggest you have them done, and here are some other stuff to just be aware of, like make sure you request, if you have to be on staff at a hospital, make sure you get whatever the rules of those are. And what we do is we say, we are going to do that for a certain dollar amount, and we do that. We provide them the comments and we let them know. And then if you want us to be involved in the negotiation process, we are going to quote that additionally. And what happens with that is it’s a great service. So we do that for almost any type of contract is that we have — the fee might be slightly different based on the type of contract, but that works really well. And from that a lot of times they will come back — and not a lot of times, actually a lot of times that is all they need, but sometimes somebody comes back and they need some additional service. We also use that as an opportunity to create a relationship with the client. So say that new physician market, I get a lot of those types of referrals, we do those contracts all the time. But we also send them a whole bunch of information about starting your career as a physician, here are things you should know, this is what you are likely to run into. By the way, here are things to think about as far as how you are getting compensated. Did you just get married and have some young kids, here are some things to think about in estate planning. Asset protection is really big for physicians; actually that’s really big for a lot of people. So we also use that as an opportunity, and we know that that’s part of our cost. So that’s your flat fee. There’s the percentage fee, which is based on the end amount. So common percentage type fees; in Iowa, we were talking to the Iowa lawyers, they charge 2% for probate. So it’s like no matter what the size of the probate. It was an interesting conversation, because 2% of a really large estate versus a really small estate; the same steps are involved in some cases. You can have a really simple large estate and a really complex small estate, but that’s still the traditional a lot of times. The other places we see a percentage fee is in real estate and M&A transactions. Sometimes it’s a percentage of the transaction costs, you run into the same types of issues. A small transaction can take just as much work, which is sometimes why you do combination fees. The other thing I call that’s an alternative fee is still a fee range. It is based on the hourly rate, or it can be based on some other ways, but you are coming up with a minimum and maximum, so that goes back to our conversation early on, where the client wants to know what is it going to cost, where is it going to be. And the range might be — you might have to give a range for pieces of the projects. The other one you see is fee caps. It’s like the maximum amount I am going to charge you for. This is not one of my favorites, because that’s where if you do the under quoting, then you end up all — of a sudden you know when you have hit the number of hours recorded and you would much prefer to go golfing or to go Pokémon hunting or something other than continue to work on a project for free. Adriana Linares: We should golf and Poké hunt at the same time. Mary Vandenack: We could golf and Poké hunt at the same time. Adriana Linares: Let’s do that. Mary Vandenack: I am in. Adriana Linares: Yeah, that would be so fun. Mary Vandenack: There’s the blended hourly rate and that is where — it’s mostly you see that in large firms, and so they will charge the same rate doesn’t matter who the provider is. And I will acknowledge, there’s a gentleman in my presentation who said to me, well, I still think you are doing something wrong with your fees, and what he said to me was I should be using the same rate to calculate my overall charges for my paralegal as I use for myself. And I looked at him and I am like, what, on what planet? Adriana Linares: Oh, okay, wait, wait, right, what that guy said to you the other night, right. Mary Vandenack: Right. And I have to tell you I am going to rethink, and that’s one of the great things about talking at the seminars, because you do think he has got a point, particularly when I am looking at the reasonableness of my fees from an ethical perspective. Adriana Linares: Yeah, that was funny with you, sorry I didn’t process it because you said that happened during the seminar, but it was when we were out to dinner, and it was funny because you and I were driving home afterwards and it was such a simple question that he asked you, and you were almost like astounded that you hadn’t thought of it, right? Adriana Linares: But I think that goes to show you that even with someone who spends as much time as they do figuring out how to run an efficient business talking to other people and just having an open mind about other ideas can sometimes really — something will snap and you go, yeah, all right, so I like that, go on. Mary Vandenack: Right. And that’s what I find extremely beneficial, I am there presenting and every time I have done it that’s been what’s happened is somebody there, and this was somebody who has been around for a long time so kind of knows our business, it’s huge. I grew up playing team sports and whether it’s a teammate who works with me or it’s somebody who is just in my profession, I think the more we can exchange information with each other, the better we do as an industry overall. So then there’s the task-based fee, which is a variation of what we talked about as the flat fee, and this is one of the ones that I use a lot, and it’s the complex planning question. So that’s when we had that conversation about, oh, it’s too hard, I do these really complex things, I can’t possibly do it. Well, you just break it down. So if I am doing a really complicated transaction, I break it down into its components and I price each piece. It’s like, I am going to charge this many dollars for forming that entity. I am going to charge this many dollars for the registration in another state. I am going to charge this many dollars for registering the ten trademarks that you are going to need. So those are the task-based fees that might be a part of the bigger project. Adriana Linares: And maybe a lot of times attorneys haven’t thought about really dissecting and deconstructing what a process on a matter takes, and that’s where that’s helpful to actually sit there and go, okay, well, I have to do A before I do B. I mean, I think a lot of times we just go into almost any project that we can do with our eyes closed and we just start doing it without really realizing that there’s a series of tasks or projects or functions that are involved. So doing that probably not only helps the client see the different rates, but it also helps you figure out what those different activities are that help you complete that matter or close that matter, right? Mary Vandenack: Right. I think what happens is if you are blessed to be really busy, it’s really easy just, you have a phone call, you have got to get this out the door, sometimes it has been sitting on your credenza, so you just jump in and do it. Adriana Linares: It’s the forest for the trees problem. I mean, it’s hard to realize that there’s a bunch of individual trees that make up that whole forest till somebody says, well, break it down. Mary Vandenack: And that’s right, you really have to kind of decide to do that, because that’s one way to function. And I just made a decision early on that was really my goal to do better than what — I went through three large firms early in my career and what I watched is, okay, there’s a cap in rates, at least in this market, so at some point you are going to only be able to charge, no matter how much experience, no matter how much knowledge you have, there is a rate cap for certain types of work. And as you get older in your career, you might want to work a little less. And so all of a sudden you are stuck, you can’t raise your rate, you want to work less hours, you would really like not to have your income go down at that point when you have all this experience, so what happens, and that was what I saw in some of the large firms. If you are totally stuck in hours times rate and then you are possibly paying associates more than they are worth to hire the top associates, well, then where does it come? It comes out at the people in the middle. And then you have in some of the larger law firms all this constant transition in the middle, which makes it kind of hard in terms of firm relationships and things like that. So I wanted to try and beat that quite honestly. Adriana Linares: Plus, I think it’s hard to get metrics and true statistics when there’s that much sort of flux and fluctuation in a law firm. But if you can figure out a system that allows you to consistently get back financial feedback, you are going to end up being better off in the end in figuring out how to use some of these alternative fee structures a little bit easier. Do you have any more you want to rattle off? Mary Vandenack: I do have another one I would like to talk about and it’s what we call the availability retainer, and a lot of firms use different variations of it, but the one — so we are always thinking when we are charging fees, fees and what you charge are also marketing. I know people really struggle with that, because they — but the presentation of the bill and how we charge is a big indicator of whether you are going to keep the client and whether they are going to call you back. So my goal has always been that my clients are annuities rather than how much can I recover on this project. And part of that is one firm that I worked at it was always about, how much can we make on this project, and if the client never called them back again because they had been charged so much, they didn’t care. So in my world that’s like, well, how can we make both of those things work, because gee, we all know that our best return business is a client that’s already found us as opposed to throwing all kinds of time and energy that we don’t have into going and chasing new clients. So I have always thought in some law firms they focus on paying more to people who bring in new clients and I am like, why don’t you pay more to those who really figure out how to keep and evolve the relationships and work for the clients you already have. Adriana Linares: It’s such a basic business principle that so many law firms cannot grasp. It’s just astonishing to me. Mary Vandenack: And hugely important. So one of the ways we do that is with this availability retainer, so what we do is, again, we target at helping clients start new businesses, and what happens with those clients is a lot of times they are new business owners, sometimes they are repeat business owners, but they haven’t dealt with all the issues. So what we know is that when they first start that business they are going to run into a whole bunch of stuff, but they also are on a budget. And so if they start to call us and they start to get these huge bills, then they are going to freak out, and then they don’t call us on the stuff that really matters. So what we tell clients, and that’s one of the areas; there is several we do this in, is a new business client, here is the deal. We are going to build into your entity formation or something else that we do for them a certain amount of, you can call us for six months with anything that comes up and there’s going to be no additional charges. And then six months from now we are going to sit down and we are going to figure out what kind of stuff you are running into, what your ongoing needs are, and then we will build you a monthly cost so that you have a budget, and then you can call us as many times as you need to for that flat monthly amount. And we will readdress that once a year and we will sit down and talk about it. We do that also in the human resource area. So we have clients that have one employee and we have clients that have thousands of employees. So the pricing is not the same across the board, but we have what happens in the bigger entity with the thousand employees is they have — it’s very rarely the owner of the business that’s dealing with the employment issues. And if you have somebody who is not paying the bill who is making the phone call to our law firm, the bills can get really big, owners then sees the bill like, what the heck. So what we do is say, look, we kind of get how that’s going on and we want you to be able to have your HR needs met, so here’s a flat monthly amount and you can call all you want, and same thing, we will reevaluate that cost. That’s been a really effective strategy. It gives the law firm a regular recurring income stream. Adriana Linares: It’s like a membership fee to Massage Envy. Adriana Linares: And if I don’t use it one month I am able to double up the next month, right? Mary Vandenack: Exactly right. Exactly right. Adriana Linares: I hate to dumb it down to something so simple. Mary Vandenack: But that’s a great analogy. Adriana Linares: But that’s what you are describing to me. That’s interesting. And not that it’s new or novel, but I mean, it’s just so refreshing to hear a law firm actually thinking about these alternative ways of billing, but that recurring income must be very welcome when things slow down. Like I know your football season is about to start here, people probably aren’t thinking about the legal needs, you are ready for those Huskers to finally do something this year. Mary Vandenack: Right, they are still hoping. Adriana Linares: What else have you got? Mary Vandenack: So the other one that’s worth mentioning is just the use of success fees, and those vary a lot by practice area. So some criminal law cases they will use a success fee, hey, if we manage to do this for you, there will be a success fee. We use them. We do a lot with the Internal Revenue Service. If somebody comes in with a huge tax bill and we will quote them a flat fee for the process and a success fee if we actually manage to settle your 100,000 liability for a $1,000, we are going to also — you are going to pay us a success fee. So the success fee is — using those successfully is designing them in a way that the client is going to be — find them like, yeah, they are happy to write you a check. If you just save them a $100,000, this is no problem. And you make your flat fee or your base fee is a little bit less to start, so that if you lose, so it’s not a pure contingency type fee, it’s almost like a sort of contingency fee, but not entirely, because you are still getting paid. Mary Vandenack: Yeah. So the true contingency fee is, if you don’t get anything done, you don’t get paid. Well, we are not going to put somebody through an offer in compromise process without having — it’s not the nature of our structure. So we might have a fee for that process that’s lower than our hourly rates would come out to be, but most of the time we have actually been very successful in that area, so most of the time we do really well and you have a lot of happy clients who don’t mind, because they just got a notice from the IRS that, yeah, sorry your $100,000 has been forgiven for a $1,000 or something like that. If they get the oops, and if we have that happen very often, we would have to reevaluate whether we wanted to use that kind of fee. So you have to look at the practice and say does this make sense for what I do. So, one other type of fee, and this one is actually newer to me, so I don’t know the details of it, but it’s worthy of mention, and so it’s the structured fee. It only works for those who do truly contingent fees, which I don’t do a lot of, but the reason that the strategy appealed to me is because it’s a tax deferral. So if you are a personal injury lawyer doing work comp or employment discrimination, things where you are getting paid, contingency, you can as part of the settlement agreement negotiate that your fees are going to get paid essentially to a life insurance company who will provide you an annuity. The aspect of that that I find really interesting is that if you get a million dollar fee one year, typically you are paying income tax on that entire fee and you might then go two or three years without having great income. This levels that into annuity payment, so it levels out your income for income tax purposes and for budgeting purpose, if that helps as well. Adriana Linares: That’s very, again, creative and interesting. Your CPA brain must really like that one. Adriana Linares: I saw your eyes light up when you said tax deferral. Mary Vandenack: Right, yeah, pathetic, I know, but it’s my deal. Adriana Linares: Okay. Well, we are going to just end here because it seems like a good stopping point. You have given everyone a wealth of information to listen to and consider. So we are going to stop here, but we are going to bring you right back for another episode, and we are going to talk in the next episode about the exact steps and some ideas that you have for helping people figure out what type of alternative fee they might like of all those ones that we just mentioned and also what I like to call Mary’s simple 6 step process to moving to an alternative fee structure. And before I do that though, let everybody know how they can get a hold of you, maybe get a copy of your PowerPoint that we have been sort of flipping through to guide us through this conversation. I think you have a wealth of information just in that PowerPoint alone. Mary Vandenack: And I would be happy to provide the PowerPoint or just have a discussion with anybody who has an interest in the topic. My email is the easiest way to get a hold of me, which is HYPERLINK “mailto:[email protected]”[email protected]. And if you lose track of that but remember my name, you can google me. I think I am the only Mary Vandenack that’s in the country. Actually I think I have a cousin in Green Bay, but I pop up on the Internet when you put my name, and so you can connect to me through LinkedIn or any other forum that works for you. Adriana Linares: Well, that’s great. So we are going to end the show. I am Adriana Linares. Thank you for listening. Hope you pop back in for Episode 2 of this great conversation with Mary Vandenack of Omaha, Nebraska about alternative fees. Make sure you visit our sponsors Clio and Solo Practice University. Join us next time for another great episode of New Solo.